I'd felt that the first issue of this two-parter was a little too familiar. So many Hellboy, and Hellboy-related comics involve creepy old houses that have something creepy living in the basement (and really - how often do people fall through floors in these comics? ), and this just felt like more of the same, but featuring Abe Sapien instead of HB. It was competent, but it didn't stand out. I feel like this issue makes up for that somewhat, because of the addition to two things: hallucinations, and Hellboy. 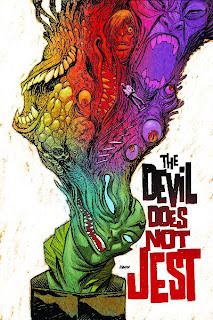 We learn that Abe has been infected with some sort of demonic hallucinogenic compound, and so things get a little psychedelic (although not ever to the extent of Dave Johnson's brilliant cover). It adds a nice touch to the story, and makes it visually very interesting. James Harren handles this stuff very nicely. The other welcome element is Hellboy himself. It's become so rare to see him interacting with characters with whom he has a long-standing relationship, and that's a shame. The camaraderie between him and Abe was a key part of the earlier stories, although for some reason, most flashback stories have him working solo missions for the Bureau. I'd like to see more like this, even though the two characters only had a couple of panels together.